It was great to see you! | Greenville, SC Real Estate Video Blog with Dan Hamilton Greenville, SC Real Estate Video Blog with Dan Hamilton: It was great to see you! 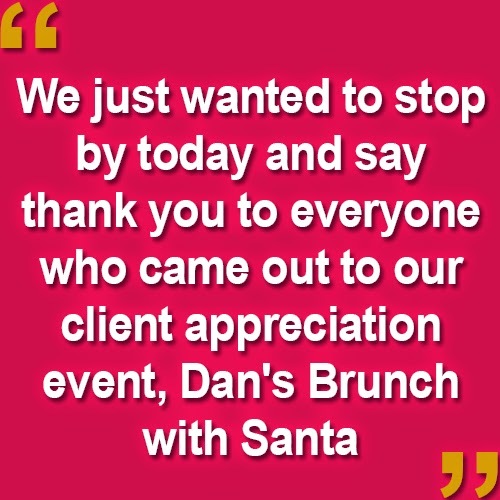 We just wanted to stop by today and say thank you to everyone who came out to our client appreciation event, Dan's Brunch with Santa. We had such a great time and hope you did too. This year was wonderful, and it was so great to connect and re-connect with so many of our great past clients and referrals. As always, we are never too busy for your referrals. If you know someone who wants the same high level of service you received working with us, let us know. We also can help with renovations, as we have a list of great partners who will do great work for an affordable price. We are here to help you and your friends with all of your real estate needs, so please remember to call us with questions and referrals. Merry Christmas and we look forward to talking with you soon!